Ten to twelve…it’s an odd clock, it can’t be trusted. An old pitcher with an old, hand crocheted “doily” from my mom’s kitchen, frequently used to keep out the odd insect. An old candy bowl, now used to hold old porcelain pieces I pick up everywhere. Many of them were dug up when we established our garden. It’s a habit I learnt from a good friend in SA many years ago and we both still do. I miss her on this odd day. There is always a piece of old porcelain lying around on the ground, telling a story of times long past. You set yourself an interesting challenge! I think my favourite is the lamp, though they’re all good. ah Ronelle, oddly beautiful…all of them! I suffer from migraines as well…about 4 to 8 a month…I understand the odd. Odd is nice – very Alice in Wonderland. I like this odd palette. 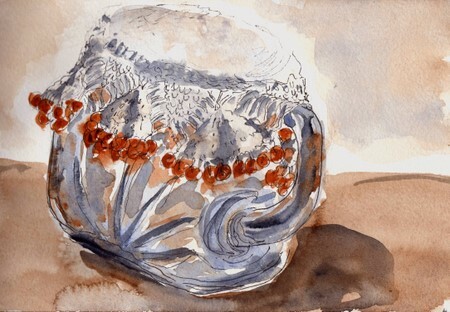 Lovely sketches, the milk jug cover with the beads took me back to my grandmother. She had crochet with beads over everything, even dangling lamp shades. To me it was like Aladdin’s Cave. Ronell — I LOVE your limited palette use – it looks great!! And even feeling odd-your work is still divine!!! 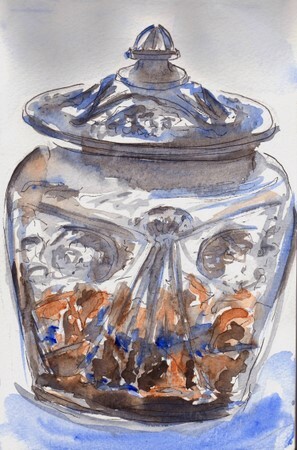 Migraine, and not in a mood to do any art………and still here are five great sketches. Although they are all super I like the eggs and the lamp. You even manage to have great stuff when having an odd day! Maybe odd is good. Hope those migraines go somewhere else. Great work all of them, but I’m sold on “ten to twelve”. I love the composition and the colors… and the line… Great work. Wow! So beautiful…I will definitely come back! Soon! Oh how I love your loose, light touch – Just Great , all of them! These are lovely – so many wonderful reflections. Odd how I just happened to drop by! I, for one am really glad you shared your odd day. These are poinent (sp) and sweet. They may be odd to you, but to me they are exquisite!! You have such a wonderfully loose and fluid style and the limited palette is fantastic (something I’ve been working on lately too!) I love the idea of collecting odd pieces of porcelain and putting them in a jar. I do hope you get over your odd feeling and your migraines. 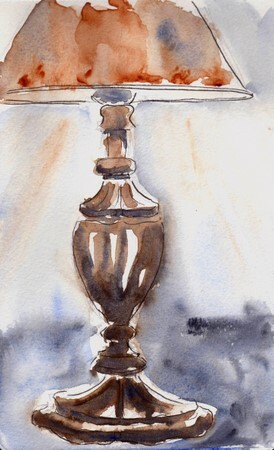 Ronell, these are wonderful – I really love the clock and candlesticks, and as Brenda says, the limited palette works beautifully. I hope you feel better, I’ve been worried about you…. These sketches are lovely. They truly capture the beauty of every day. There’s peace and serenity in them. I hope those elements color your days, and less odd days frequent your doorstep. I do love the way you turn your everyday life into these quirky writings and beautiful moody sketches. 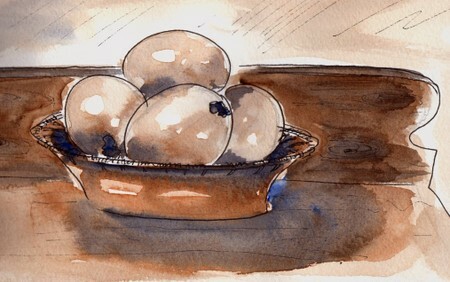 I like that colour palette and the slightly out of focus look about the sketches.I hope you are feeling better. These are fantastic! I can only aspire to such looseness and juicy color. actually all the odd stuff turned out to be really good. These are all beautiful odd things! You did an especially nice job on the glass objects. I hope you are feeling better! Wonderful collection of oddments! It’s really fun to see your mind working, the way you string together your sketch vignettes! The eggs are just wonderful. But so are the glass containers. How on Earth can you make them look so lively, shiny, airy and beautiful???? You have a real talent there. What a feast for the eyes! I like the candlesticks and eggs the best. 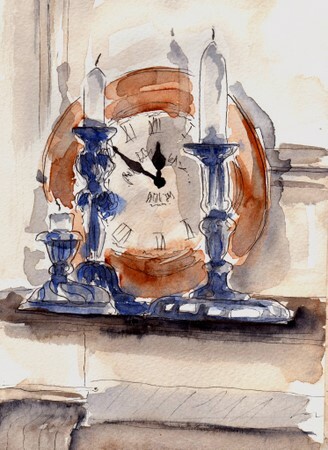 I’m drawn to burnt sienna and clocks so this painting is one I would love to posses. The colour combo is very calming so I use these as often as possible in my home. I find them soothing. Your “odd sketches” are moving. Next Next post: Bon voyage to Casey!